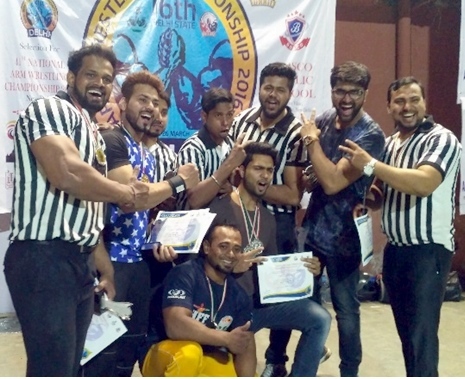 Armwrestling Association of Delhi organized the 16th DELHI STATE ARM WRESTLING CHAMPIONSHIP 2016-17 on 25thand 26th March 2017 in association with BOSCO PUBLIC SCHOOL, Sunder Vihar, New Delhi. Mr. Sahil Duggal and Mr. Rajiv Duggal inaugurated the function and gave their Best Wishes for the Championship. The General Secretary of the Association and coach Laxman Singh Bhandari announced the First two winners of respective weight categories would be selected for the 41st National Arm Wrestling Championship 2017 being held in Hansraj Model School, Punjabi Bagh, New Delhi from 18th to 21st May 2017. More than 550 men and women participants from 25 states teams will be in Delhi. Sanjay Deswal in Senior Men Left and Right, Neetu in Senior Woman and Sahil Sharma in Junior Boys won the Champion of Champions Delhi Title in the Tournament. There were various categories in which the players performed. In the Sub. Junior Boys 30 kg Param, 35 Kg Ravi Navin Punia and Jaskaran Singh, 40 Kgs Ajay, Karan, Tarun, 40+ Kg Airish Tarid, Nikhil Rahul. In Junior Girls 50 Kg Siya Gautam, Mrigya Khanna, 50+ Parishi Malhotra, Saryu Bhatia, Chavi Aggarwal. In Junior Boys 50 kg Gurdeep Singh, Sunny, Airish Tarid , 55 Kgs Karan Thakur, Taha Tarid, Gurdeep Singh, 60 Kgs Karan Thakur, Rajat Bisht, Taha Tarid, 65 Kgs Rajat Bisht, Kritik Malik, Manish Godra, 70 Kgs Vikesh Pandey, Kritik Malik, Somnath Pati, 80 Gaurav, Aman Pawar, Perminder Singh, 80+ Sahil Sharma, Basant, Suzal Kapoor. In Senior Men Right 55 Kgs Karan Thakur, Arun, Shivam Tripathi, 60 Kgs Rajat Bisht, Pankaj Kumar, Ravi, 65 Kgs Gaurav Singh, Teekam, Gurpreet Singh, 70 Kgs Wasim Ahmed, Nayan Joyti Bora, Gaurav, 75 Kgs Abid Saifai, Prince Kumar, Suraj, 80 Kgs Rajat Rawat, Lalit Rathi, Vibhor Rana, 85 Kgs, Sandeep Sheoran, Yogesh Kumar, Teginder Singh, 90 kgs Rohit Sheoran, Sandeep Sheoran, Suresh Yadav, 100 Kgs Sanjay Deswal, Nand Kishor, Abhishek Adlakha, 110 Kgs Sanjay Deswal, Abhishek Adlakha, Aditya Bhandari, 110kgs Vinayak. In Senior Women 50 Kgs Poonam Tariq, 65 Kgs Neetu, 80 Kgs Ishmeet, 80+ Vartika Bhandari, Kiran. In Senior Men Left 55kgs Karan Thakur Abhishek Kumar Shivam Tripathi, 65 Kgs Bhupender Singh, Kritik Malik, Prince, 70 Kgs Wasim, Abhishek Rawat, Saranpreet, 75 Kg Abid Saifi, Prince, Aman Pawar, 80 Kg Rajat Rawat, Arvinder Singh, Divyanshu Pandey, 85 Kg Sandeep Sheoran, Ankit Shahi, Ruchit Luthra, 90 Kg Harpreet, Suresh Yadav, Sarabjeet, 100 Kg Sanjay Deswal, Maninder Singh, Nand Kishor, 110 Kg Aditya Bhandari, Jaspal. In Disabled Men 60 Kg Sukhdev Singh, 75 Kg Abid Saifi . In Master Men 70 Kgs Laxman Singh Bhandari, 90 Kg Sarabjeet Singh, Arvinder Singh, Tejinder Singh, 100 Kg Harpreet Sethi, 100+ Vinod Kumar secured 1st 2nd 3rd position in their weight categories respectively.